Debra Weiss, our first storyteller in our first show, led us off again with her tales of living a year in Yosemite. Aaron Gilley proved to us that Van Morrison didn’t know what he was talking about. Newcomer Yousaf Sajid described his post-collegiate morass and the hike with threatening deer. Door Jam regular Rosemarie Harper shared how she grew up on the beach but only grew to love it later. Newcomer Andrea Rowland took us on a journey across two continents of bodies, skinny-dipping, and the composition of shyness. Newcomer Anna Jones pulled us into her enthusiasm for an eccentric Natural Bridge fiberglass artists. Jason Bennett divulged his family’s ancient secret, a childhood encounter with a bear, and its parallel to later life. Newcomer Liz Lowenstein closed out the night with her account of a tired and hungry hike in Valencia, Spain. It was another tight competition with Big Blue Door Jam jam ultimately going to Yousaf Sajid! Thanks to our fabulous volunteer judging teams of Team Sketchy Peeps, Team See Otter, and Team Viscious & Delicious! and our house managers and volunteers! Thanks to local media, especially The C-ville, The Hook, and WTJU for helping us get the word out! Thanks especially to the Black Market Moto Saloon where you can slate all your food, beverage, and motorcycle needs! Big Blue Door’s next show will be our first ever Sketch Show at The Bridge next Thursday and Friday only, June 27 & 28 (8 pm $5)! Not a true stories show exactly, but true stories were part of the process of creating it. 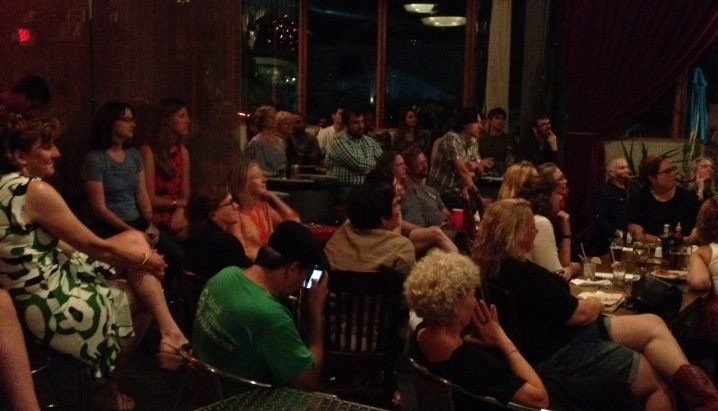 We’ll be back at Moto Saloon for our final event of Big Blue Door’s first year of existence, our Big Blue Door Slam. Thursday, July 18th. Jam jar winners from our 2013 shows plus some runners-up compete for the title of Big Blue Door Slam Grand Slammer.